You'll have good luck with this Irish design of shamrocks & gold! 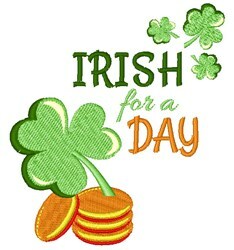 Add it to a sweatshirt or cap to wear on St. Patrick's Day! Windmill Designs is happy to present Irish For A Day machine embroidery design which has 8206 stitches and is [79.50 mm x 89.18 mm] large. If you would like to view more embroidery patterns please search on our embroidery designs page.